This week's Tuesdays with Dorie (TWD) recipe was chosen by Gaye of Laws of the Kitchen: Tropical Crumble. I'm not a big nut person, so I omitted the nuts from the streusel topping. Usually when I do this with other recipes, the topping still comes out crumbly. However, with this recipe, it all kind of just melted away and I ended up with one big brown layer on top and what looked like baby food underneath! It was not a pretty sight. So much so that I would be embarrassed to post a picture of it! 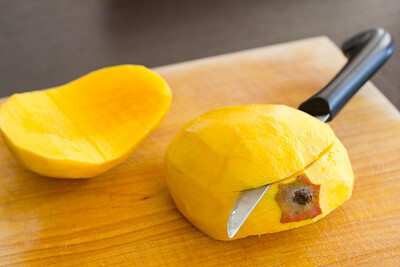 I know that a post without pictures is boring and kind of useless, so instead I'll share with you photos of how to cut a mango. For some this may be easy, for others maybe not so much. 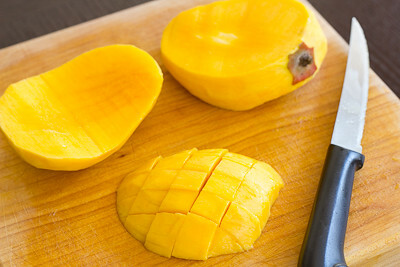 I grew up eating mangoes, so I never really thought anything of it, but I've found over the years that not everyone knows how to properly cut a mango. First off, when you're choosing a mango, look for one that is more rounded and less oval. The plumper and rounder mangoes are going to be sweeter. 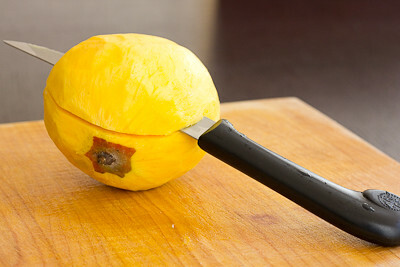 After you've peeled your mango, you'll want to lay it on its side (I like to use a vegetable peeler but if you're more skilled with a knife you can use a knife - I just end up wasting so much flesh when I used a knife). 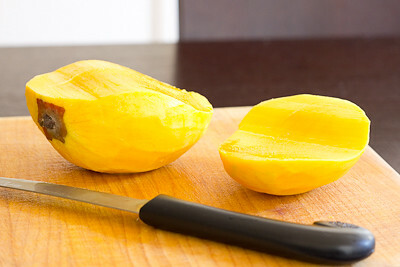 Starting about half an inch above the stem, start cutting longitudinally through your mango. 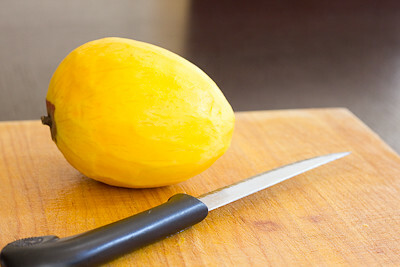 It is important that you cut from the stem towards the opposite end and not the other way around, because this will prevent you from getting too many fibers from the seed in your cut mango (should you get too close to the seed and start skimming it with your knife). Once you've removed one half, flip the mango over and repeat with the other side. Now that we've talked about how to cut a mango, let's talk about the actual tropical crumble. I would have never thought to pair mangoes with bananas but the flavors are fantastic together. The mangoes are caramelized in a skillet with brown sugar and butter, then the bananas are added and just barely cooked through. The filling is then finished off with some fresh chopped ginger and grated lime zest. Looks aside, this dessert was fabulous. The mango and banana are a perfect pair, and the ginger and lime zest give it just a little kick. I found the dish was a bit too sweet (even for my sweet tooth) when it was served warm, but it was surprisingly delicious served cold. I suspect this would be great served with some ice cream too! Thanks Gaye, for hosting this week. I can't wait to make this one again. If you would like the recipe, you can find it here. Make sure you check out the TWD Blogroll, to see how everyone else enjoyed this tropical treat! I've never seen a mango cut like that, but I love it! It looks much easier than what I typically do, I can't wait to try it. Mmmmm, I am swooning at the mango photos. Can't wait til the summer here when mangoes arrive. i thought mine was totally unphotogenic, too! a whole mango is so much prettier. thanks for the lesson. do you just use a peeler to get the skin off? i usually slice the "cheeks" off with skin and then sort of fillet them to get the skin off. i have no idea why i do it that way. My crumble melted away and mine wasn't pretty either. I don't really know how to cut a mango, mine was a slippery mess! At least I tried. This is great! I just went ahead and posted my unappetizing photo; you are so much smarter. I think the topping should have had half the butter, and I'll make it that way next time. Sometimes when I skip nuts, I'll sub in oats instead. Chomping on the seed is the best part of cutting a mango. Sounds like a recipe I'd better check out. If only I'd seen this post a few years ago, I would not have a unitasking mango cutter in my drawer! (Although I have to say it does a pretty good job.) Thanks for sharing your tips! Mango is one of my favorite fruits in the world and a tropical crumble sounds amazing!